You now know where to stay in Baguio, what else is there to do while you're in the City of Pines? Here are some of the spots and cafes that we tried during our trip. More than anything, fall in love with Cafe Yagam's homey atmosphere. It was one of our first stops, and obviously we needed a coffee break to rest and recover from the 5-hour travel. But more than the ambiance, you'll appreciate their fresh coffee and Cordilleran cuisine. Enjoy an afternoon here, or even have a nice dinner. Pax and Trice waiting for our FOOD! We had buffet style of their merienda offerings and coffee. I like the suman and pesto sandwiches. For their menu, click HERE. Follow them on FACEBOOK. Back in the day, you'll find me in a wagwagan (other term for ukay-ukay) almost weekly. So whenever I visit Baguio, the night street ukay-ukay at the Harrison Road is heaven. Not only do they have MORE selections than my Metro Manila sources, their prices are also way cheaper! Ten Pesos top, anyone? We parted ways because of the insane crowd (be mindful of your things! ), so Cha and I took charge. Some tips when you go to Harrison Road's Ukay: Bring small bills, don't bring too much things - just the essentials, bring a huge ecobag if you're planning to shop a lot (manipis plastic nila, and also para eco-friendly nadin), and of course: Don't be afraid to meticulously look through the racks one-by-one! Hidden gems await. Ayan na mga kalaban! Hahaha, just kidding! It was a fun night of shopping, and obviously the fashion bloggers went crazy! 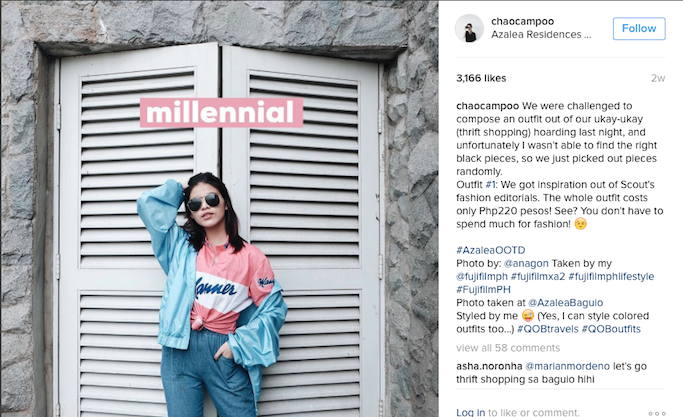 If you want to see the looks that each group came up with, visit the hashtag #AzaleaOOTD on Instagram! Btw, our group won! Yehey! Our winning entry! That's a denim jumper with a pink jersey shirt, layered with a pastel blue bomber jacket. Total cost of the whole outfit = Php 220! This place is just a stop-over on our way to the BenCab Museum. Located in downtown Baguio, the Bell Chinese Church basically houses Chinese elements from pagoda, dragon arches, Buddhism artifacts, literature, etc. They also celebrate several Chinese festivals in this location (Lantern Festival, Chinese New Year). When we went there, kids were having their PE class. This is my second time at the BenCab Museum, but I happily tailed along with the group. I had nice memories of this place, one of my favorites is the view of nature at their coffee shop (Cafe Sabel) + the yummy vegetarian lumpia. Enjoy local art + new featured installations on your every visit. Plus, it was a treat to have Sir BenCab himself when we went there!!! Thank you Sir for obliging with the photo ops! For more information, visit BenCab Museum's official website. With no plans of going back, here I am again at the place that freaked me out the most. Had not so good experience the last time I went to the Diplomat Hotel, so I just stayed at the ground floor while the rest of the group explored the place. It was my own personal way of respecting the spirits that I think I bothered before. I also noticed changes here and there, first they have a log book upon entry, a free tour, a standee of the Pope at the entrance, and walls were covered with small, colorful paintings as if to brighten up an otherwise spooky atmosphere. Anyway, if you're in for a thrill, then visit at your own risk! Here's the second artsy cafe that we visited in this Baguio trip. 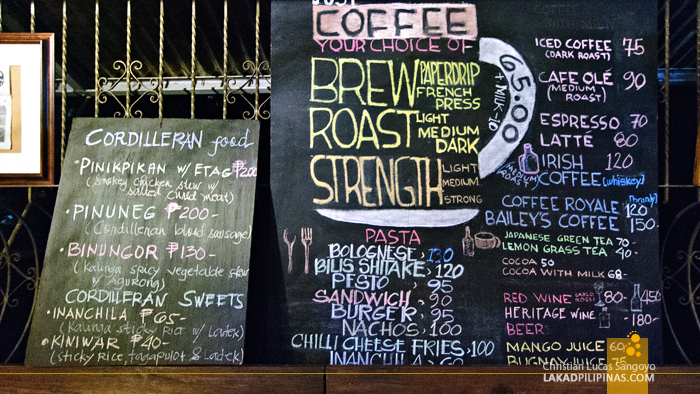 When you're in Baguio, visit as many local coffee shops or restaurants as you can! Quaint and with a wonderful view, Arca's Yard is a nice tambayan. Don't forget to try their unique Camote Pie and special Arca's Cloud Tea. Perfect combination. On our last day, we had a stop-over at the Camp John Hay where we took pictures at the forest area. But aside from a nice venue for your OOTDs, Camp John Hay also houses a world-class golf course, shopping center, restaurants, and hotels. If you're looking for something crazy while you're in Baguio, then head over to the Tree Top Adventure, also located at the Camp John Hay. They have ziplines, trekking, rides, and tree drops. Conquer your fear, while enjoying the view! Get ready for a memorable experience without spending too much. Enjoy your stay in Baguio by bringing your family and friends with you. For group accommodations, I recommend Azalea Residence Baguio for their spacious rooms, good location, and commendable service and facilities. Read more on that HERE. Special thanks to Kuya Melo of http://outoftownblog.com! Hi, what camera did you use?